Looking to avoid the chocolate indulgence this Easter? Whether your little one can’t actually eat chocolate or whether you’d simply just like a healthier alternative to the usual Easter gift this year, Tots have put together a list of our Top 10 non-choc Easter gifts. Whilst still ensuring the fun and excitement of Easter day, these lovely gifts are perfect for a Spring without sugar, and are still within budget. Take a look at these wonderful gift alternatives to traditional chocolate eggs, they’re sure to delight little ones, minus the chocolate frenzy! Egglings are incredible grow-it-yourself mini gardens, nestled inside an egg. Outwardly appearing as an extra large egg, your little ones will be amazed when after they break its top, they find a mini garden inside, ready to grow! The seeds are already sown into the Eggling’s soil; just use a spoon to tap on its top, water it when required, place in a bright spot, and watch a garden unfurl before your eyes. Plants continue to grow in the eggling for around five months, after which they can even be replanted in your garden so you can continue to enjoy them. You can choose from several varieties including Wild Strawberries, Lavender or Mint! Perfect for babies, this super-cute gift set includes a soft hooded towel, a bath mitt and a matching bib. Made from 100% velour cotton terry towelling, it has a very luxurious silky feel, which is also perfect for protecting baby’s delicate skin. Although still a sweet treat, these delicious hand-made shortbread bunnies are a lovely alternative to chocolate. Coming in boxes of 6 chunky bunnies, these scrumptious shortbread treats are made with wholesome ingredients, with no additives, and last for up to 3 months (if you can resist them that long!). They come in three delicious flavours, traditional, vanilla or lavender, and are packaged beautifully in eco friendly boxes, with a matching ribbon and even a personal gift tag so that you can include your own Easter message. They sell out very quickly though so be sure to order soon! Just like everyone’s favourite fairground activity, Bath Time Hook a Duck involves the simplistic yet surprisingly satisfying action of, well, hooking a plastic duck. After floating a few ‘ducks with hooks’ around the bath, just slot the fishing rod together and watch your little ones have a whale of a time catching the four floating quackers. Perfect for bath time fun, this simple concept can provide lots of enjoyment- try and resist having a go yourself! This exquisite wooden personalised bunny makes for a beautiful Easter keepsake which can be hung up each year; it can be personalised with a name, yellow, pink or blue ribbon and a date can even be written on the back, if you’d like. Made from plywood birch and hung with natural twine, each bunny is hand painted in a soft grey and embellished with a lovely little fluffy white tail. This lovely little bunny is actually a seed paper sheet, that blossoms into wild flowers when planted. Embedded with wildflower seeds and flowers/ferns, this gift will make a stunning addition to your garden. Made from unique seed paper, the Plant a Bunny arrives in a lovely ribbon-tied pocket, also containing planting instructions and seed paper information. These giant 4ft or 6ft colour-in posters are perfect for keeping little ones busy doodling, right through the Easter holidays. Bursting with Easter toys, decorations and even a cute little chick all to colour in, these posters can provide hours of enjoyment. Each poster is topped with the phrase ‘Happy Easter’ although this can even be personalised with your child’s name or any other message you would like, up to 45 characters. 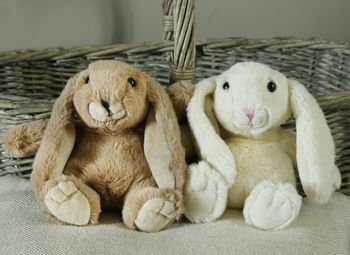 This beautiful set of felt Hen, Chick and Bunny finger puppets will make great Easter entertainment for younger ones. Super for use as prizes in an Easter egg hunt or to even keep everyone entertained at the dinner table, the puppets arrive in a pretty presentation pack decorated with spots and Easter Eggs. Gift Horse offer a wonderful selection of knit kits to suit knitters of all abilities; these three musical birds keep things simple for new knitters, with chunky wool, bamboo needles and everything you need to make and decorate your mini trio. For a little added fun, three small bells are also enclosed so if you want to (and you think your child is old enough for them to be used safely) you can make your birds jingle when you give them a little shake. There is something for everyone this Easter, so if chocolate isn’t for you or your kids then not to worry- you will still be spoiled for Easter gift choice! Keep an eye out for our upcoming article providing inspiration about some fun Make and Bake activities to have a go at this Easter or visit our site HERE to book your baby & toddler friendly break for this Easter. Images belong to respective sellers, Tots to Travel do not own any product images on this page.